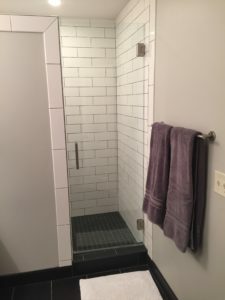 Adding a custom glass feature to a bathroom as an add-on to an existing bathroom or a feature in a remodel, can be the difference between a finished bathroom and a fantastic bathroom. We recently finished a project at the home of Mark and Gaby Ryan. We installed two vanity mirrors above the double sink in the master bathroom that extend from counter to ceiling, wall to wall. The mirrors were custom fit for the space, making a huge impact in the remodeled bathroom. We also installed a custom-fit glass shower door master bathroom remodel in the Ryan home. A frameless glass shower door offers an open, seamless and contemporary look to any bathroom, and glass shower doors are sturdy and structurally sound. Water tight seals eliminate leaking, and because there is little to no metal used on frameless glass doors, there is little concern for corrosion. The appearance of a glass shower door, or lack thereof, creates the illusion of a larger space, and allows the beauty of the tiles and design features to be highlighted. Glass shower doors are also easy to clean and maintain their original, sleek look. 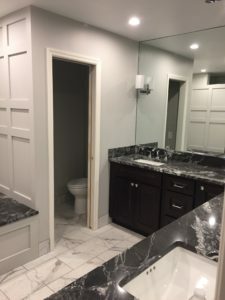 Mark and Gaby were so happy with the impact of the glass door in the master bath, they decided to add a similar door to the main bedroom bathroom. The existing shower, which was part of a remodel a few years ago, was not a standard size so a shower door off the shelf was not an option. 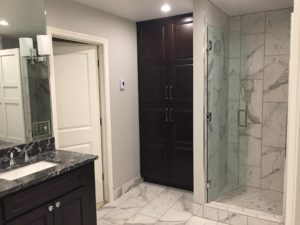 “After finishing the master shower, we realized that a glass shower door on the walk-in shower in the main bathroom was needed to complete the look”, said Mark. 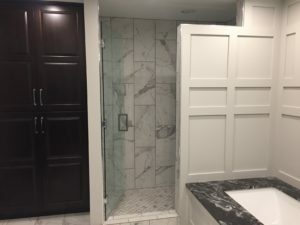 We measured the existing space and created a custom door for the space, avoiding a complete remodel to the shower. “Quality Glass offered us a cost-effective solution and we are so happy with how it completes the look of the bathroom”, said Gaby. 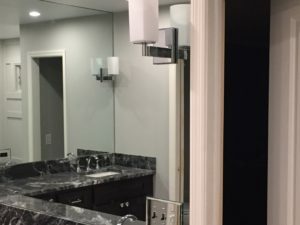 In addition to the new shower door, we also replaced the existing wall-hung mirror with a custom wall mirror above the vanity. The Quality Glass team utilized the Mav 300 Loader and the Lampo Cutting Line for the fabricating process for the electrical outlet and wall sconces, and the large, seamless mirror measuring 4’ x 6’. It also creates a huge impact in the room and makes the bathroom appear larger and brighter. Give us a call if your bathroom needs a custom glass feature!